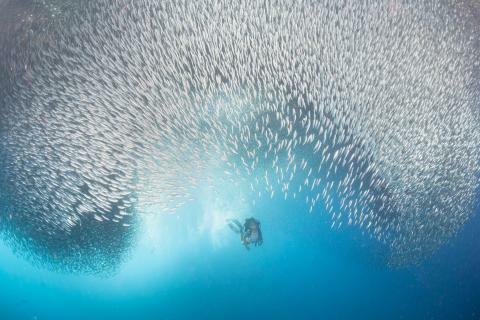 Image Description: An immense school of sardines make way for a Scuba Diver enjoying an array of shimmers and shadows exhibited by the shoaling million. Taken in March 2018 at Moalboal Philippines, it's the only place on Earth where this nature's spectacle happens on a daily basis. Shot the image at around 10 meters deep, the shot required a fisheye lens to capture the immense size of the shoal juxtaposed enabling me to get close enough to light the immense school just perfectly.